Wagner has outscored seven district opponents 466-22 and pitched five shutouts. Veterans Memorial has broken new ground just about every time it has stepped on the football field this season. First varsity season. First varsity touchdown. First varsity victory. First district victory. First winning streak. And on and on. 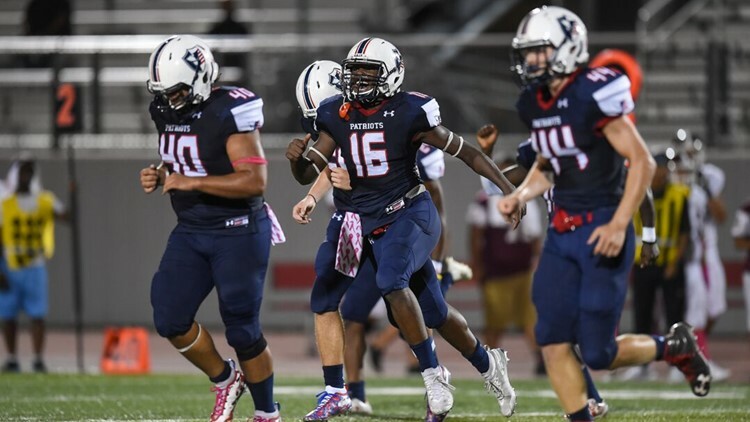 The Patriots could record another first Friday night when they play Judson ISD rival Wagner in a District 13-5A Division I game at Rutledge Stadium. A Veterans Memorial victory would clinch at least a tie for the Patriots’ first league championship with one week left in the regular season. Vets Memorial opened in 2016, but played a junior-varsity schedule in its first two seasons. The Patriots moved up to varsity play with this year’s University Interscholastic League biennial realignment. Wagner, 8-1 overall and 7-0 in District 13-5A Division I, can wrap up its first football league title with a win over Vets Memorial in the Thunderbirds’ regular-season finale. Wagner has a bye in the week preceding the start of the playoffs.The Thunderbirds moved down from 6A to 5A with this year's realignment. Second-place Vets Memorial (6-2, 6-0) trails Wagner by a half-game heading into Friday night’s clash and ends its regular season against third-place Sam Houston (5-3, 5-1). “It’s been really exciting,” Patriots coach Richard Mendoza said. “The kids have started to jell together as a team. I think our non-district schedule was tough, and I think it helped our kids realize what it’s like to have to play varsity football. Wagner and Veterans Memorial are No. 1 and No. 10, respectively, in the KENS5.com Sub-6A area rankings. Vets Memorial has won six straight since starting the season 0-2. The Patriots fell to Floresville 33-21 in their opener and to Boerne Champion 38-21 the next week. They bounced back with a 41-7 rout of Lanier in their first district game, and have improved steadily each week. Vets Memorial, which had a bye last week, posted consecutive shutouts against Highlands (41-0) and Jefferson (34-0) before beating Burbank 41-14 in its last game Oct. 19. Wagner lost to Class 6A power Judson 35-28 in their annual Hammer Bowl, but has looked invincible in district play, outscoring seven opponents by a combined 466-22 and pitching five shutouts. As the Patriots have prepared for their first marquee game, Mendoza has stressed to his players the importance of maintaining an even keel. “I think it’s been business as usual,” he said. “I don’t want to make it bigger than it needs to be. We need to remember that it’s just a game. Yeah, it’s kind of cool to be in a game like this, but at the end of the way, it’s a game. It’s a unique opponent, but it’s another district opponent. The Patriots’ biggest challenge Friday night will be slowing down Wagner’s explosive triple-option offense, which is averaging 507.4 yards (417.7 rushing, 89.7 passing). Senior quarterback Tobias Weaver has done a masterful job of running the option, rushing for 823 yards and 12 touchdowns. Weaver, who averages 11.6 per carry, has passed for 751 yards and 14 TDs. He has yet to throw an interception. Mendoza was offensive coordinator at Wagner in 2015, when Weaver was a freshman and occasionally participated in drills with the varsity. Three years later, Weaver is one of the best quarterbacks in the San Antonio area. While Weaver is the Thunderbirds’ catalyst, they have another talented offensive threat in sophomore running back L.J. Butler, who has rambled for 1,119 yards and 19 TDs. Butler has averaged 12.3 yards per attempt. So, how do you contain such a prolific offense? “I think it’s going to come down to making sure we play assignment defense,” Mendoza said. “Make sure we read our keys and do our job. They’re waiting for you to make one small mistake, and next thing you know, they pop it for 50, 60, 70, 80 yards. That’s a tough offense to defend. Although not as prolific as Wagner, the Vets Memorial offense is hardly a slouch. The Patriots are averaging 395.7 yards – 251.4 rushing and 144.3 passing. Senior quarterback Joseph Richardson has completed 61 of 100 passes, with five interceptions, for 869 yards and nine TDs, and has run for 499 yards and seven more scores. Senior Imari Motley is Vets Memorial’s top rusher with 524 yards and seven TDs. Mendoza, a 1997 Judson graduate, is a good friend of Wagner coach Charles Bruce, who is in his sixth season as the head of the Thunderbirds’ program. The two were assistants together on Pete Gibbens’ staff at Wagner when the school opened in 2005, and Bruce was Mendoza’s boss for one season when the latter returned to Wagner in 2015 after a three-year stint at East Central.